Office 365 has exploded on to the technology scene providing the perfect opportunity for small and medium sized businesses to take advantage of all the great technology that Microsoft has to offer. Our team is not only familiar with building out business tools in your Office 365 environment, we can help you with administration and site architecture planning. 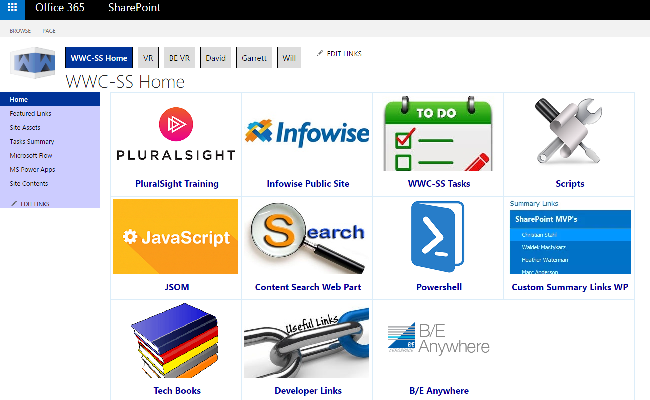 Out of the box SharePoint can be look a little bit "plain vanilla" which makes users bored and disengaged. We want to help you to get the most out of your tools and make your environment look great! We offer branding customization that will take your dull out-of-the-box environment and make it look great by using your own preferred branding and navigation customization. Navigation is a critical aspect of your environment. We'll help you buy creating a warm and inviting navigation system as well as a featured links navigation system that uses tile images that look great and provide an inviting user interface for your users.